I like Facebook memes but sometimes they are like the PEZ dispensers of knowledge: no context, no nutrition, just tasty 10 seconds of mouth enjoyment. 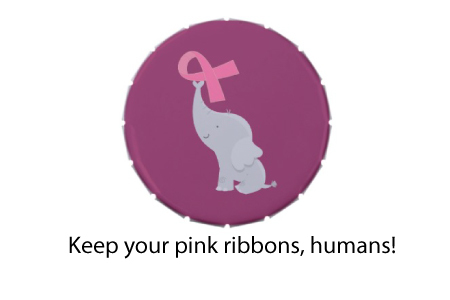 I saw a posting about Elephants not getting cancer, which is actually at the heart of what I’ve been saying for years- that when you have high activity (by efficiency or copy number) of telomere maintenance and DNA damage detection/cell apoptosis, you can stay healthier as long as replacement stem cells are preserved. This article from JAMA argues that the 4.8% cancer mortality rate for large and long-lived elephants compares favorably to our 25% rate because unlike our two copies of the p53 (watchman of the genome) gene, they have up to 40 copies. Therefore, their cells are very able to detect abnormalities and kill themselves. 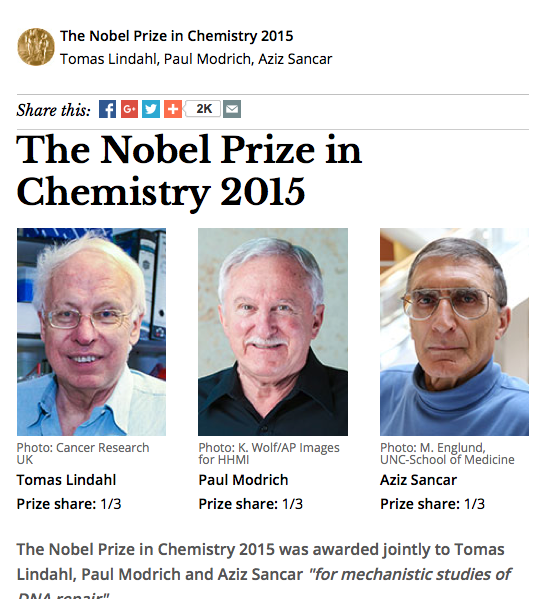 Fittingly, the Nobel Prize in Chemistry this year was awarded to scientist for their work in some interesting DNA repair mechanisms. Their prize was in excision and mismatch repair, which are like the proof-readers of the genome. The truth is that even with a background of proofreading and editing, the system is designed to erode except in our precious stem cells. The mortal non-stem cells obey a Hayflick Limit, and they are meant to die off. Telomere erosion is the dominant mechanism of DNA destruction that is a sina qua non of cell replication. 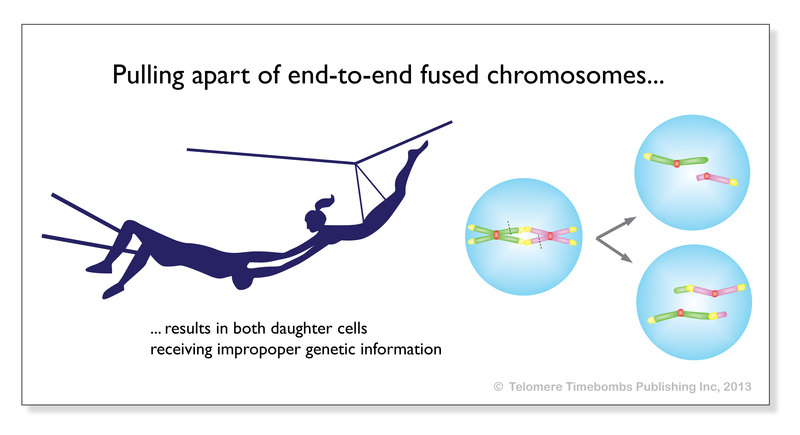 This telomere shortening leads to end-to-end fusion because the DNA repair machinery ‘believes a naked end is a cut end and wants to reconnect it by non-homologous end-joining. These double chromosomes lead to non-disjunction during subsequent cell divisions, leading to p53-triggered apoptosis, which an elephant’s cells would be 20X more likely (with 40 alleles of p53) to autodetect and then autodestruct (apoptosis). 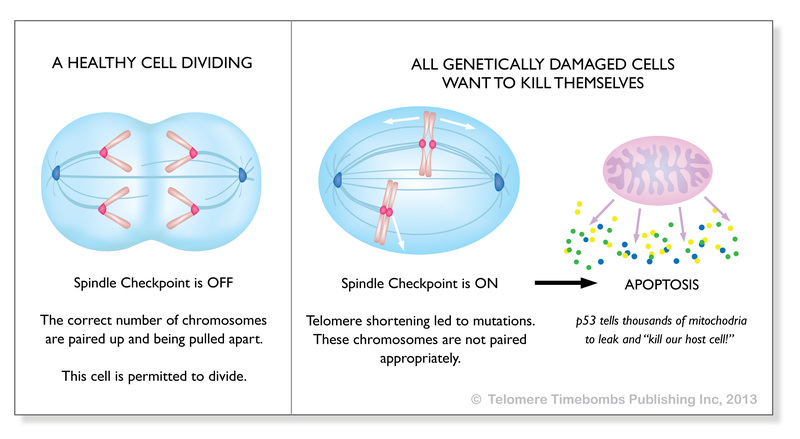 These illustrations were created by me for my book, Telomere Timebombs: Defusing the Terror of Aging. To understand more about DNA Damage and Repair, watch this video that I did in 2010, the year after the discovery of Telomerase won the Nobel Prize for Medicine or Physiology.